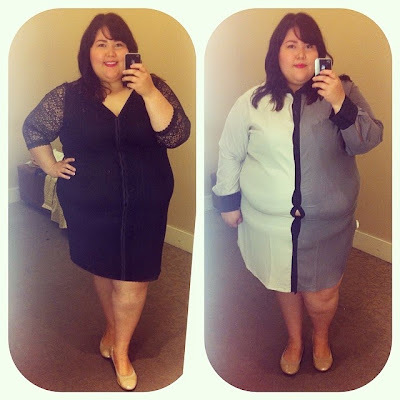 I tried on a few pieces from the Isabel Toledo for Lane Bryant collection yesterday. My local store didn't have all the pieces yet. Luckily, they had two of the four dresses I coveted. The black dress is gorgeous! Lace, V neckline in the front and back, lightweight, and oh so soft. The second dress, though I love the design, didn't work for me. I went up two sizes and there still wasn't enough stretch. Case and point: the gaping between the buttons on my stomach. I also purchased a white sleeveless top with a lace panel and damask-ish illustration. The collection, as a whole, is beautiful. I'm really impressed with the designs, modern touches, and variety in styles. What do you think about the collection? Do you plan on buying or trying anything on?